What exactly is this wine tourism thing? As we leap in to 2013, I am gearing up for a year of possibilities; a year of trips; a year of experiences; a year of wine! I am excited to be participating in the 2013 Internatinoal Wine Tourism Confernece, this year in Zagreb, Croatia. As i prepare for that adventure, I am reflecting back on what I have learned about wine tourism over the past 2 years, since I was in Portuagal at the 2011 Wine Tourism Conference. Wine tourism is an ever evolving thing. At it’s core, it is the travel and tourism of people that are seeking destinations orbiting wine and food. But, it is an evolving industry. There is a boom in growth in wine culture, in the US, and internationally. Those who define themselves as wine tourists tend to be more affluent, with a higher level of education and also tend to spread the word about their experiences when they return home. With over 90% of wine tourism happening as an adjunct to visiting friends & family, there is an untapped market that is ripe for the picking. Given that, in my small area, there are over 1000 wineries, with more than 2000 in the state of California, how do you stand out? How do you identify your target audience, and attract them to your business? As a wine tourist myself, I am often overwhelmed by the sheer number of offerings in a small wine region. Selecting which establishments will benefit from my business is always a taxing exercise. When I am alone, I target places I have never been. However, how do I select destinations when I am in a group? What makes you stand out? Being unique and being intriguing is a key factor in this over saturated market. As I plan my trip to Croatia, the state of wine tourism in the US and beyond is in the forefront of my mind. 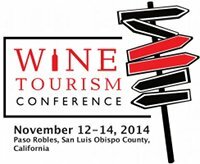 After being piqued by the conversations that occurred at the 2012 Wine tourism Conference in Santa Rosa, I am excited to explore this topic more. While I had already set my discussion topic (with my fellow blogger and co-presenter Liza Swift of BrixChicks) I am infinitely curious about what other people do to attract wine tourists to their regions. I spontaneously broke in to lengthy (geek) discussions while in Portland recently about how their evolving urban wine scene is unique to the area, and different from the Willamette Valley (more on that later). In California, there is so much more to wine tourism than the well known grape producing regions of Napa & Sonoma. There is an entire culture of wine and food that is a large economic part of the state’s bottom line. But, outside of those primary tourism destinations, and perhaps some of the regions made famous in Sideways or Bottle Shock, do you know about the smaller, alternative destinations? Creating a brand identity for an international tourism audience is paramount to success. You don’t want to be foreever known as the winery where Miles drank from the spit bucket, or one that produces (gasp!) Merlot, if you can’t express why your Merlot is out of this world. This is true for any wine region that wishes to enhance their wine tourism audience. 1. If you are wine tourism business, what are you doing to create a unique message to attract visitors? 2. If you are a wine tourist, what attracts you to a new (to you) business? What keeps bringing you back to your favorites? Have a great trip, Thea! Enjoy the wine and the adventure! Regarding your first question, I am on a panel to present "Turning Customers into Brand Ambassadors" at this year's Eastern Winery Exposition. We hope to provide wineries with the tools they need to actually provide a great experience for wine tourists, thus creating ambassadors for their winery. There is more recognition of wine tourism from wineries/vineyards with tasting rooms. There is also a beginning understanding of what "providing a great experience", my presentation at this year's IWINETC, is about. yeah me too. I never understand this before about wine tourism and right now I am having a great idea and thanks much for all the help..
Nice travel tips and guidance. thanks for sharing. I think it’s great. Thanks for nice posting..